Quelques hélicoptères stationnés à Parchim arboraient cet emblème symbolisant l’Armeyskaya Aviatsiya. © H.Mambour. Some helicopters based at Parchim had that badge on the nose, which symbolised the Armeyskaya Aviatsiya. © H.Mambour. October 28, 1948, when the first aircraft squadron also equipped with helicopters was established at Serpukov near Moscow, is considered the anniversary of the creation of Army Aviation. However, the rotary-wing component of Soviet aviation forces operating in support of the Soviet Army was a branch of the VVS. Helicopter aviation initially was referred to as being auxiliary. Its missions included movement of cargo, fire adjustment, reconnaissance and maintenance of stable communications on the battlefield. Over time during technical evolution, helicopters were transformed into an independent asset for fire support to troop units from the air. 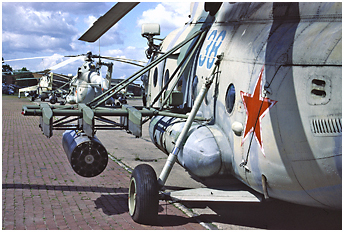 In the mid-seventies (which corresponds to the Mi-24 entry into service), the helicopter component of the VVS was reorganized to become Ground Forces Aviation (Aviatsiya Sukhoputnykh Voysk - ASV), better known as "Army Aviation" (Armeyskaya Aviatsiya - AA). In 1989, that branch of the Soviet armed forces became independent, however, the AA helicopters finally were reintegrated into the VVS structure in January 2003. Helicopter units supporting the ground forces were organized into separate helicopter squadrons (Otdel'naya Vertoletnaya Eskadril'ya - OVE) and separate helicopter regiments (Otdel'nyy Vertoletnyy Polk - OVP). These units often adopted a more precise designation reflecting the nature of their mission: OBVP, OVP BU, OVE BU, OVO... The organization of the AA units in the GDR underwent considerable changes during the 1980s and to describe them accurately is a true challenge. The OVE OP did not exist before the mid-1980s. Separate detachments designated OVO (Otdel'nyy Vertoletnyy Otryad) equipped with Mi-2s and Mi-8s were operational before the creation of the OVE OP. 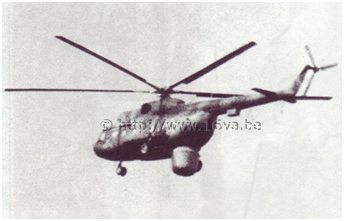 The OVO disappeared when the OVE OP were established to include Mi-24s in addition to Mi-2s and Mi-8s. The reorganization process started in 1987 in the GSFG did not reach its intended conclusion because of the fall of the Soviet Union and the withdrawal from Germany. We can now assume that the original plans were to supply each tank division and motorized rifle division with its own helicopter regiment. Captain Yuriy Kulilov who served with the 241.OVE OP at Hassleben from 1983 to 1987 declared in 2006: "Our helicopter squadron was assigned to the 39th Guards Motorized Rifle Division (GvMSD) in Ohrdruf. Our mission was to provide combat/fire support for the 39.GvMSD in offensive as well as defensive modes. Firing training with on-board cannon, unguided rockets and bombs took place at the Ohrdruf range. 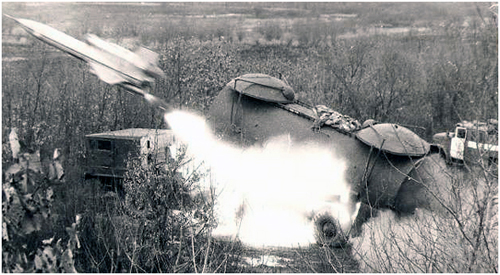 Live-fire exercises with anti-tank missiles took place at the bombing range at Wittstock. Our squadron commanders were Lt Cols Skibin, Proskurnish and Trubin. I commanded a helicopter crew and piloted a Mi-24V. 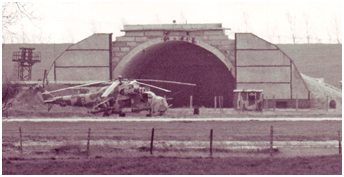 Along with Mi-24 combat and Mi-8 transport helicopters, we also had Mi-8 and Mi-9 command posts in our inventory. 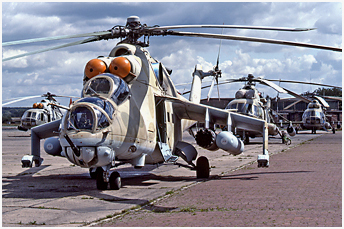 The previous Mi-2 model was decommissioned in 1987. 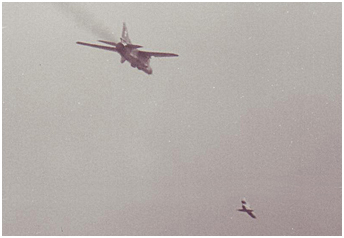 Our squadron consisted of three flights (zveno), each consisting of two pairs (para) of helicopters. The concept of the development of Army Aviation units foresaw a balance of military power in Europe. The number of attack helicopter within NATO divisions was approximately 200 (sic). We, however, had only one helicopter squadron (OVE OP) per ground combat division. The planning, therefore, was to organize several regiments based upon the helicopter squadrons already in service. But, from where and how to acquire so many helicopters and pilots? And as restructuring perestroika began, everything just fell apart." In the GDR alone, this affected 20 divisions and the same number of combat helicopter regiments. In addition to the five combat helicopter regiments (OBVP) already assigned to the command levels of the armies, the helicopter fleet would have had to reach a number exceeding 1600, which was absolutely not achievable. Thus, the Soviets had to improvise by combining the already existing OVE OPs (3). There were about 20 OVE OP scattered over many airfields and at other sites. Sometimes two or three OVE OP could be stationed on a single airbase as was the case at Parchim, Oranienburg, Dresden-Hellerau, Brandis, Stendal and Nohra. During the second half of the 1980s, OVE OP squadrons gradually disappeared and merged (three to four units at a time) to form OVP BU-type (Otdel'nyy Vertoletnyy Polk Boyevogo i Upravleniya or separate combat and control helicopter regiment) regiments. Consequently, the number of bases where AA helicopters were stationed decreased. Heir to a structure born in the context of the Cold War, Soviet, and then Russian Army Aviation in Germany was composed of a considerable number of helicopters and units. In the context of German unification and the inevitable withdrawal, the geographical locations of AA regiments and squadrons were consolidated by concentrating units and disbanding most detachments. In 1991 at the beginning of the withdrawal process, the five Russian ground armies in Germany - 1st and 2nd Guards Tank Armies (Gvardeiskaya Tankovaya Armiya - GTA), the 8th and 20th Guards Combined-Arms Armies (Gvardeiskaya Obchevoyskovaya Armiya - GOA) and the 3rd Combined-Arms ("Shock") Army (Obchevoyskovaya ("Udarnaya") Armiya - OA), each controlled two separate helicopter regiments organized in two very different structures (see > AA Order of Battle). The first of these regiments that we will designate "Type 1" was an assault and combat helicopter regiment (OBVP). It was composed of three squadrons organized into two attack squadrons with five flights (Zveno), each comprising four Mi-24D/V/P "Hind-D/-E/-F," for a total of about forty helicopters, and an assault squadron with five flights totaling 20 machines. 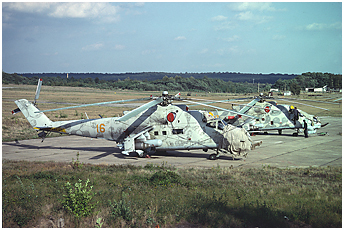 Two flights of the latter squadron were composed of four Mi-8TV "Hip-E" each, two more flights included four Mi-8T "Hip-C" each (later partially replaced by Mi-8MT and Mi-8MTV-2 "Hip-H") and a flight equipped with two Mi-8VzPU "Hip-D" and two unidentified special versions of the Mi-8T (4). The second regiment that we shall call "Type 2" was a more specialized combat and control unit (OVP BU). Its mission was direct support to the ground forces attached to the ground army to which each regiment was subordinated by deploying autonomously as close as possible near the units needing their support. It also comprised three squadrons. However, the latter were composed of both heterogeneous and theoretically similar machines. Each squadron comprised two flights of four Mi-24D/V/P "Hind-D/-E/-F" attack helicopters, two flights of four Mi-8T/TV/MT/MTV-2 "Hip-C/-E/-H" assault helicopters, a pair of Mi-24R "Hind-G1" NBC reconnaissance helicopters, a pair of Mi-24K "Hind-G2" reconnaissance and artillery control helicopters and a pair of Mi-8VzPU "Hip-D" (flying command post) or Mi-9 "Hip-G" (flying and ground deployable command post) helicopters. In addition, each of these armies controlled a versatile separate combat and control squadron (OVE BU) equipped with approximately fifteen helicopters. They generally included five to ten assault and/or transport helicopter models (Mi-8T/T "Salon" "Hip-C," Mi-8MT/MTV-2 "Hip-H" or Mi-2T/U "Hoplite"), one light command-post helicopter (Mi-8VzPU "Hip-D" or Mi-9 "Hip-G"), a pair of heavy command-post helicopters (Mi-6VKP/Mi-22 "Hook-B/C"), a pair of electronic warfare helicopters (Mi-8PPA "Hip-K"), a pair of Mi-24R "Hind-G1," a pair of Mi-24K "Hind-G2" and sometimes a very rare Mi-8R ELINT helicopter equipped with a retractable antenna radome. When we add the helicopters of the specialized unit based at Cochstedt to the effectiveness of the aforementioned versatile Armeyskaya Aviatsiya units in the GDR, those of the squadron based at Sperenberg and the four squadrons of the Oranienburg transport and assault helicopter regiment, all units reporting directly to the 16.VA, we reach the impressive number of about 600 helicopters. When we consider that the firepower of a standard combat helicopter regiment was superior to that of a fighter-bomber aviation regiment flying MiG-27 "Flogger" or Su-17 "Fitter," one can easily imagine the threat these units represented for NATO forces. Soviet Army Aviation in East Germany had a remarkable degree of standardization. It had just four basic helicopter models in its inventory: Mi-2 "Hoplite," Mi-6 "Hook," Mi-8/9 "Hip" and Mi-24 "Hind." Un lanceur SPU-143 monté sur chassis Zil-135 photographié à Redlin en juin 1979. Un véhicule de relevé géodésique UAZ-452T est visible à gauche. © USMLM. 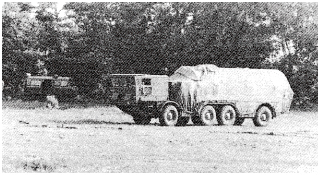 A SPU-143 mobile launch ramp mounted on a Zil-135 chassis at Redlin in June 1979. A UAZ-452T geodesic survey vehicle can be seen at left. © USMLM. The helicopters were not the only flying machines the Soviet Army employed. During the 1980s - and for most of them until 1990 - each ground army indeed had a separate reconnaissance drone squadron (OEBSR: Otdel'naya Eskadril'ya Bespilotnykh Samoletov-Razvedchikov) (5) equipped with the VR-3 complex that was composed of Tupolev Tu-143 Reys (Voyage) drones, TZM-143 carriers, SPU-143 mobile launch ramps, testing and maintenance vehicles that comprised the KPK-143 complex, a POD-3 data processing unit and various support vehicles. Four VR-3 systems were assigned to each squadron, representing a total of twelve Tu-143 (four carriers with two drones each and four launchers each with a drone) per unit. This daytime reconnaissance drone had a detachable nose section that could be adapted with three different sensor configurations: TV, photo and radioactivity reconnaissance. Information collected could be disseminated via data link. With thanks to Stefan Büttner for the additional information about the AA reorganization. It remains to be proven if such units were deployed in the GDR. See a more detailed description of an OBVP on this page. (2) OVE BU units probably experienced the following evolution: OSAE > OVE > OVE BU. an OVE. The 113.OSAE from Sperenberg was the only unit of this type that survived in the GDR. (3) This paragraph from "Beginning of the end" by Stefan Büttner in Aircraft, November 2009. See > Multimedia. 20.GOA 290 oebsr Mahlwinkel - it would seem that this unit was probably based at Küstrin-Kietz until the end of the 1980s.